On or very near this date in 1912,* Russian troops in the northern Iran city of Tabriz publicly hanged eight men for resisting the tsarist occupation — including the city’s highest mullah, Sikat-ul-Islam. Russia’s invasion of Tabriz the previous month brought a bloody curtain down on the Persian constitutional revolution of 1905-1911. Persia shook in those years with a brave but doomed movement that was simultaneously constitutionalist and parliamentarian against the rotting Qajar dynasty, and nationalist against foreign intervention (specifically by Russia and Great Britain) — and thus was resisted by monarchists and foreign powers alike. Constitutionalists had been able to march on Tehran in 1909 and chase the hated Shah Mohammad Ali into Russian exile, leaving the Qajar throne in the hands of his 11-year-old son. ** But it was the imperial powers who maintained the true vigor of reaction. At this same time, Russia — which had throughout the 19th century periodically peeled Caucasus real estate away from the Qajars — occupied Tabriz in 1909 to force that capital of Iranian Azerbaijan to submit to a monarchist siege. Its troops were only ever withdrawn to the outskirts, poised for the next two years to intervene again against the precarious constitutionalist state at a moment’s notice. That moment arrived in 1911 when Tehran, advised by American Morgan Shuster, provoked St. Petersburg by attempting to collect taxes in the northern Russian sphere and to expropriate the property of the Shah’s brother. The Russians struck back by seizing Tabriz to install the rule of a pro-Russian warlord, also exploiting the occasion for a wide purge of constitutionalists who were invariably slated with the crime of attempting or advocating resistance — or as Russia preferred to phrase it, “extermination of the Russians,” as if the tsar’s military interposed in a foreign city constituted a put-upon minority enclave. Shuster, whose ouster the Russians demanded (and by their intervention effected), later wrote a book about his experience that’s now in the public domain, The Strangling of Persia. On New Year’s Day, which was the 10th of Muharram, a day of great mourning and held sacred in the Persian religious calendar, the Russian Military Governor, who had hoisted Russian flags over the Government buildings at Tabriz, hung the Sikutu’l-Islam, who was the chief priest of Tabriz, two other priests, and five others, among them several high officials of the Provincial Government. 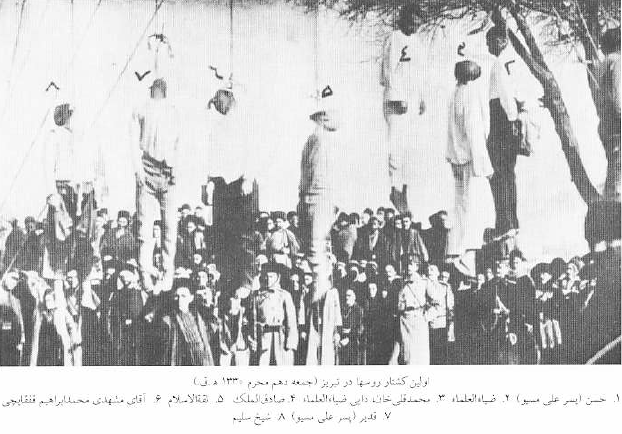 As one British journalist put it, the effect of this outrage on the Persians was that which would be produced on the English people by the hanging of the Archbishop of Canterbury on Good Friday. 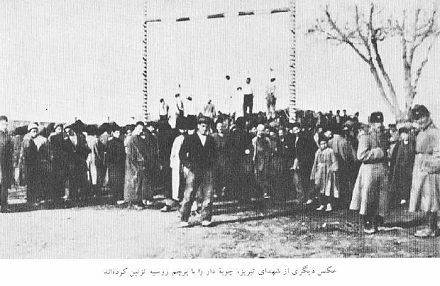 From this time on the Russians at Tabriz continued to hang or shoot any Persian whom they chose to consider guilty of the crime of being a “Constitutionalist.” When the fighting there was first reported a prominent official of the Foreign Office at St. Petersburg, in an interview to the press, made the statement that Russia would take vengeance into her own hands until the “revolutionary dregs” had been exterminated. “True humanity requires cruelty,” Russia explained, Orwellianly. Two views of the Jan. 1, 1912 hanging of eight Persian constitutionalists in Tabriz. The gallows is gaily painted with Russian white, blue and red stripes. As Shuster indicates, the shocking eightfold hanging this date would be followed by many more executions in the weeks to come as Russia (together with Britain in the south) buried the constitutional era for good. Our Sikat-ul-Islam’s “crime” set the tone: he acknowledged writing a letter to a friend in another northern city noting with approval that Tabriz was resisting the Russians and others ought to do likewise. * Multiple western newspaper reports of the time (e.g., London Times, Jan. 4, 1912) place the event on January 1 per the Gregorian calendar. It’s also noted and denounced) for its impolitic occurrence on the Shi’ite sacred day of Ashura, the 10th day of the month of Muharram on the Islamic lunar calendar; unfortunately, this complicates rather than clarifies the chronology, as different Hijri calendar converters translate 10 Muharram to different Gregorian dates. I’m going here with January 1 based on the period’s reportage as supported by Shuster (in an excerpt in the post) as well as by Browne in Letters from Tabriz: The Suppression of the Iranian Constitutional Movement. (e.g., the chapter title equating 3 January 1912 with 12 Muharram) However, one can also find knowledgeable citations attributing the executions to December 31 or January 2. ** The refugee Shah would try and fail to return with Russian backing in 1910-11. He ended up dying in exile in Italy. † Some additional details about these people is drawn from The Iranian Constitutional Revolution, 1906-1911, by Janet Afary.